Ernst's Economy for you: Will applied robotics turn middle and lower class workers into ‘the firemen on electric trains’ of the 21st Century and eventually lead to a new era of joblessness? Will applied robotics turn middle and lower class workers into ‘the firemen on electric trains’ of the 21st Century and eventually lead to a new era of joblessness? On steamtrains, firemen did traditionally one of the most important jobs: they had to keep the fire under the steam boilers burning fiercely at all time, in order to generate enough steam for the steam train to reach its destination. It was tough and dirty work, only suitable for the strongest and toughest of men. However, this came all to an end with the invention of the (diesel-)electric train, for which no firemen were needed anymore to run the steam engine and operate the train. Not because these firemen held indispensable positions on these types of trains and were really necessary to operate the engine or the valves and switches on these trains. No, reputedly they kept their position, because the then-powerful labour unions demanded from the railroad companies that their jobs would be maintained until the last fireman would retire. A job out of pity; not out of necessity. 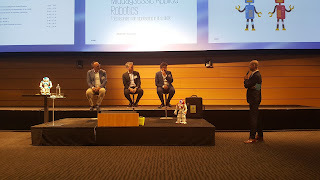 I had to think about these ‘firemen on electric trains’ when I visited a conference about applied robotics, organized by the Dutch accountancy firm KPMG and hosted by Joris Juttmann of KPMG and René de Monchy of BNR News radio. Joris Juttmann is the Director Finance Management Advisory of KPMG and involved in Finance Robotics. René is a very intelligent, curious and learned journalist with a big interest in the future of labour, with whom I brainstormed on a few occasions about the Dutch banking industry. 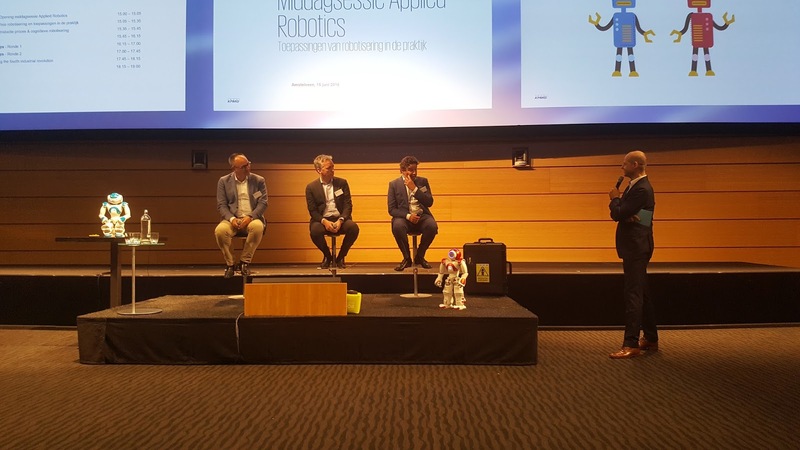 The conference existed of two keynote speeches and two break-out sessions with suppliers of robotics software, like IBM’s Watson, IPSoft’s Amelia and a few suppliers of RPA (i.e. robotic process automation) tools. These suppliers all covered different areas of the development ladder of applied robotics, with an automated (i.e. robotized) invoice processing tool as relatively simple tool and IBM’s Watson as the epitome of robotic tools today. At the end there was a panel discussion between the suppliers of these tools and guests of the conference. b. shed a light on the coming ten years, in which the development of applied robotics will undoubtedly cause a dramatic paradigm shift for many, many low AND high educated office and blue collar workers and will lead to really new and sophisticated, strategic decision-making tools for the executive boards of tomorrow’s companies. To be fair: I am definitely from the robot, android and cyborg generation that emerged in the 2nd half of the 20th Century. Therefore I can draw a Cylon (from Battlestar Galactica), Star Wars’ R2D2 and C3PO or Twiki from the Buck Rogers’ series with my eyes closed. Not even to mention Arnold Schwarzenegger as the legendary Terminator. This meant that I had to switch off my fantasy and I had to understand that applied robotics has less to do with autonomous and hostile (or friendly) steel humanoids, than with robotized and computerized processes that can run nearly unattended 24 x 7 and execute a shedload of administrative work at times when normal workers sleep. Robots and robotized tools that can understand and communicate with human beings in ‘natural language’ too: currently mostly in English, but with many more languages underway. While the demonstration of programmable toy robots (see the aforementioned picture) in the beginning of the conference was a little bit too ‘toy-ish’ and childish for my personal taste, the program as a whole was a very good and interesting listen. As I had to make a choice, which suppliers and products I would visit during those two break-out sessions, I chose for IPSoft’s Amelia (i.e. a robotized, context-sensitive call centre clerk) and IBM’s Watson. 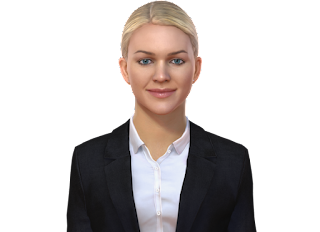 Amelia, a robotized and animated helpdesk/callcenter clerk looked in the demonstrated version perhaps too much like an archetypical, somewhat restrained blond girl from Sweden, but her capabilities seemed quite impressive. "She" was not only capable of speaking and understanding natural language in voice and writing (i.e. not just collecting keyword-driven snippets of information, but literally understanding whole phrases and sentences), but her sophisticated software enabled her to fully understand the contents, context and emotional tone-of-voice of the caller’s message and adjust her own tone of voice and cartoonized expression to the mood and words of the caller. Amelia demonstrated – as a call centre (sales) clerk for a health insurance company – that she could understand inquiries in natural language (both in speech and written) about new/additional insurance products and administer an exact answer about how much these would cost for the customer. She also changed her tone of voice and looks when a customer called with a serious illness or complaint. During this whole demonstration IPSoft showed the trees of changing, context-driven and topical answers, as well as her full range of robotized emotions and her language understanding and answering capabilities with respect to the subject, from which Amelia could pick her pronounced or textual answers and cartoonized and verbally expressed emotions. IPSoft also showed that Amelia could connect to all required systems in the backoffice to offer product calculations and other answers to customer’s inquiries. In a certain way, this robotized call centre clerk was akin to the early expert systems, that were already under development in the Nineties, but it was all way more sophisticated, intelligent and topical than in those years. I still have some serious doubts whether today’s pampered, well-informed and assertive customers want to be helped by a robotized and cartoonized ‘girl’ with a peculiar voice, that tries to understand the customer. Yet, I had to admit that a patient, 24 x 7 available customer call centre clerk, always offering immediate and on-the-spot service, sounds like a good deal for online shoppers. Especially when her language, emotional and context-sensitive capabilities are indeed as good as promised during the demo. Besides that, the fact that tough and complicated questions or uncomfortable conversations with angry customers will immediately lead to human intervention by real employees, might be a critical success factor for Amelia. 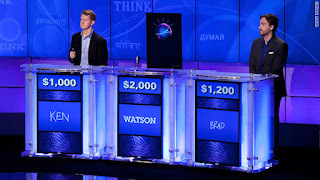 Nevertheless, when Amelia represented the Junior League of Baseball for robotized tools, IBM’s Watson was definitely representing the World Series in this category. According to IBM, this tool – that won a game of Jeopardy against the best and most seasoned human players ever, at the expense of a ‘token’ $10 billion in initial investments – is reputedly able to ‘crunch’ 300,000 documents per second(!) in human language. makes Watson probably the boardroom tool of the future. One of the most promising examples of Watson being able to wrangle unstructured data, is the fact that it is used by medical doctors and institutions to find cancer forms and assess their gravity on x-ray pictures and CT scans. Of course it is quite hard for an unexperienced listener to distinguish between sheer ‘marketing babble’ and genuine, truthful information about Watson's real achievements. Yet – with IBM’s reputation and future at stake – I do believe that Watson is a future factor to reckon with, even though it is yet extremely expensive to purchase, load and operate. Therefore the tool has still a very high threshold for ‘common’ companies, but that threshold will probably diminish when prices drop and loading of information will become easier and quicker. Nowadays tools are emerging that can check the whole administration of large companies, instead of doing ad random checks on a limited set of corporate information like human auditors do. This means that these tools are able to check every transaction, general ledger entry and manual correction, being made by every department of the company during the business year. On top of that these tools are also able to write the mandatory auditors’ statements about the quality and reliability of the business administration of the company, which are part of quarterly and annual reports and other mandatory information to shareholders. There are also tools that can book, distribute and process all invoices, purchase orders and sales orders without any human intervention at all. Or robotized distribution systems that can pick millions of sales orders in huge warehouses around the clock and make them shippable for the distribution trucks, without one single human being around and within minutes after the order came in from the customer. Will this all go at the expense of numerous lower AND middle class jobs?! You bet! While I was already worried about the relatively simple, lower class jobs in distribution centres, warehouses and supermarkets, I was actually quite surprised to learn last Wednesday that even complex and intelligence-requiring, higher middle-class jobs like auditor, accountant, notary, legal counsellor and fiscal specialist are now on the line, due to these financial and business robots. And even though IPSoft’s Amelia still looks quite grotesk and clumsy and has a clearly non-human, robotized voice that probably few people will appreciate, I definitely see the potential in this tool for large online shops and worldwide operating companies. This all happens at the expense of large and independent, humanly operated, around-the-clock call centres positioned all over the globe. As that was the message of this conference: almost ALL repetitive, routinely labour and activities can already be executed by robotized processes today and the development still goes on and on. These unstoppable developments might turn the people, who are currently working in such jobs, into the ‘firemen-on-electric-trains of the 21st Century’: tolerated for what they were and could do in the past, but not really useful anymore in the light of the latest developments. In my humble opinion, it is without a question mark that the robotization of the workplace will lead to massive loss of routinely and repetitive labour, as maybe tens of thousands of jobs are on the line in The Netherlands alone and millions of jobs globally. Think about millions and millions of accountants, auditors, lawyers, call centre clerks, distribution centre and supermarket employees who can be dismissed and replaced by machines, which can do their jobs 24x7x52 each year. Without hesitation and without ever getting tired or bored. It is nearly impossible that all these dismissed people will find a different job very soon. Many of them might become unemployed for quite a long time. Therefore many (or all) humans have to focus on what makes them special and different from these (administrative) robots and computerized processes. They have to develop their creativity, their improvisational capabilities and their unaddressed talents in order to become indispensable again in the 21st Century. This is a grim outlook, but it can also be an opportunity to change one’s life for the better. For the simple reason that routinely and repetitive labour is seldomly the most interesting job for creative and intelligent people, looking for challenges.